To date can not be said with 100% certainty what project was called FVA-7. It is most likely that the "M 1a" is meant as an extension to the "M 1" by Hermann Mayers construction, although it was not FVA member, but a close associate at the time of construction of the "M 1". By utilizing thermal updrafts one was freed from geographical boundaries. The FVA whose gliding had previously been done on the western slope of Orsbach so that the disadvantage of their geographical location was taken.away. The second reason for the renewed focus on the glider was the really decisive. One day appeared at the Institute of Aerodynamics a young wizard who designed a cheap glider with corresponding benefits for the Aviation Club Aachen. It was Hermann Mayer, who had in 1928 been on the Wasserkuppe to learn gliding. Hermann Mayer was not until much later FVA member, but joined the group, by close links to the FVA in time and was treated as a normal member. In 1929, he designed a glider called "MI". It was built by the glider pilot group of Segelfliegergruppe des Luftfahrt-Vereins Aachen in the workshop of the Aerodynamic Institute, and Hermann Mayer took part in the Rhön with this design in 1929. 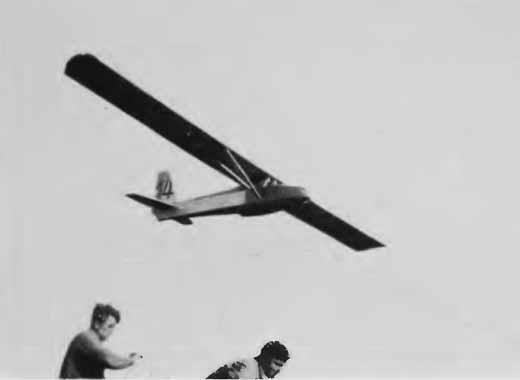 The "MI" was a high-wing strutted in a simple design because it was intended as a training glider. This machine was t only slightly inferior compared he then advanced gliders. The design was proved to be suitable.for club work shops. 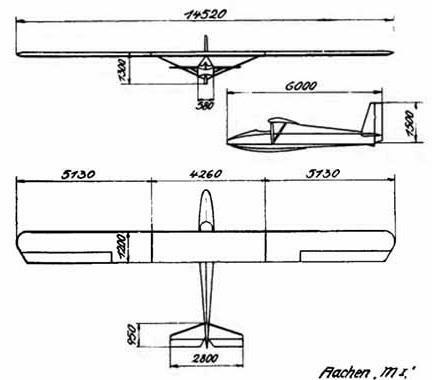 "It was intended in the design to create a not too difficult to fly and advanced students, good sail-performance training aircraft (hence limitation in the span, robust construction), which should come close in his performance the " Professor "type without to essential exceed the cost of the "Prüfling" . The hull is planked from front to rear spar with plywood, the rear covered with fabric. The wing has three parts with a continuous profile (Göttingen 535), the center piece is braced by V-struts. The ailerons are designed with torsional plywood nose, thereby achieved that most diagonals could be omitted. This promotes the rudder center of gravity in the vicinity of the axis of rotation and the risk for vibration of the rudder is greatly reduced. The success of Hermann Mayer on the Rhön competition in 1929 prompted the FVA now to build a "MI". This machine was improved in detail and carried the designation "M la". The design improvements probably come from Hermann Mayer and not by the FVA. The biggest change was an increase in the span of 16.5m compared with 14.5 m of "MI".